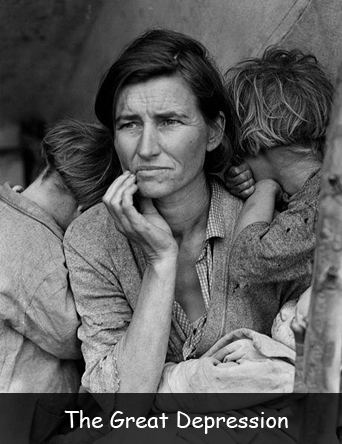 The Great Depression was the economic crisis in the 1930s. It lasted from 1929 to 1939. It was the longest, deepest and most pervasive depression in American history but its effect was felt in all corners of the world. It did not happen overnight. The price of everything escalated on almost a daily basis. It began soon after the stock market crash of October 1929. This depression peaked between 1932 and 1933. It was the time approximately 15 million Americans were unemployed and half of the banks had failed. October 24th 1929 is known as ‘Black Thursday’ when 12.9 million shares were traded and October 29th 1929 is known as ‘Black Tuesday’ when 16 million shares were traded. The circulation of money was so low that the U.S. didn’t mint nickels in 1932 or 1933. Approximately 6,000 street vendors in New York City tried to sell apples for 5 cents each. The Empire State Building, the Chrysler Building, the Golden Gate Bridge were all built as a part of depression era worker relief program. Bing Crosby’s song “Brother, Can You Spare a Dime” was the most popular song in 1932. Hebert Hoover was the President during the Great Depression.. The Wall Street Crash of 1929 was one of the main causes of the Great Depression. Approximately 3 million children left their schools. The average annual income of an American family fell from $2,300 to $1,500. The ‘Three Little Pigs’ was seen as a symbol of the Great Depression. The board game Monopoly was released in 1935 and became very popular. The Dust Bowl during the Great Depression led to extensive migration. Franklin D. Roosevelt became President in March 1933. He promised a ‘New Deal for the American People’. Declan, Tobin. " The Great Depression Facts for Kids ." Easy Science for Kids, Apr 2019. Web. 21 Apr 2019. < https://easyscienceforkids.com/the-great-depression-facts/ >.